John Tavares not only helped win the game for the Toronto Maple Leafs, he also entertained Toronto hockey fans by scoring his 300th and 301st goals as the Maple Leafs beat the New Jersey Devils in New Jersey. The only downside was that he set his record on the road, and I am certain that Devils fans were not nearly as celebratory as Maple Leaf fans would have been had the game been at the Scotiabank Arena. Other Maple Leafs who have scored 300 goals include Mats Sundin (420 goals), Darryl Sittler (389 goals), Dave Keon (365 goals), and Ron Ellis (332 goals). Obviously, because this is Tavares’ first season in the Blue and White, he hasn’t scored all his goals with the Maple Leafs. It just seems fitting, though, that this personal record came wearing the uniform of his hometown Leafs. Tavares’ landmark goals were numbers 28 and 29 of the season. He scored his first 272 regular-season goals during his nine seasons with the New York Islanders. This season he’s on pace to beat his previous career high of 38 goals in a season by a wide margin. Just two games past the midway point, his 29 goals are well past a 50-goal-season pace. To understate it, he’s fitting in quite nicely with his new team. One has to appreciate Tavares’ exquisite hand-eye coordination and his ability to pick up the puck. His 300th goal demonstrated those skills in spades. First, he tipped a Jake Gardiner shot from the point; second, when that shot was saved, the ever-diligent Tavares separated the puck from the skate blades, gathered the rebound, and backhanded it past the goalie. The goal seemed so typical and so perfect. What did Tavares have to say about his record? “It’s always more satisfying when it contributes to a big win, especially bouncing back after the other night, so credit a lot of guys who I’ve played with over my career because obviously, that was a big part of helping me be successful,” Tavares diplomatically noted. Tavares’ second goal came off a nice bit of three-way passing, started by a no-look, backhand pass from Mitch Marner, to Morgan Rielly, to Tavares. Tavares reciprocated by assisting on Marner’s empty-net goal in the last minute to seal the victory. Tavares and Marner were aided by left winger Zach Hyman, who had missed eight games with an ankle injury. Defenceman Ron Hainsey also scored in Toronto’s three-goal first period. That doesn’t happen often and is only goal 57 of Hainsey’s 17-season career. 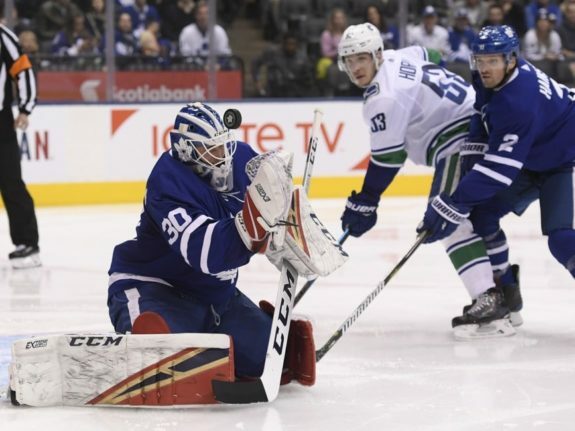 Emergency goaltender Michael Hutchinson, whom the Maple Leafs got in a trade with Florida on Dec. 29, made his fourth straight start because Frederik Anderson and Garret Sparks are still sidelined with injuries. He made 27 saves in the game to raise his record to 2-2 with the Maple Leafs. Tavares’ two goals put him three behind Washington’s Alex Ovechkin for the NHL lead. As noted, Tavares is having his best season ever. In his previous record season (2014-15), he scored 38 goals and 48 assists with the Islanders. He now has 29 goals and 21 assists in just over half a season with the Maple Leafs. Tavares is only the seventh player drafted after 2005 to score 300 goals. He’s in good company with Sidney Crosby, Steven Stamkos, Phil Kessel, Patrick Kane, Jonathan Toews, and Anze Kopitar. 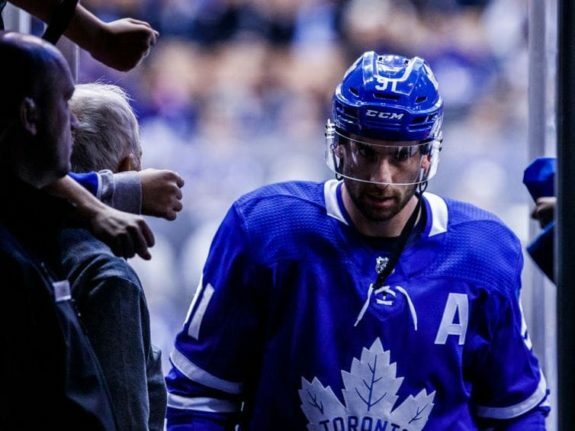 The post Maple Leafs’ Tavares: 300-Goal Scorer appeared first on The Hockey Writers.